Dengue fever is a viral disease transmitted by the Aedes aegypti mosquito, whose propagation has spread rapidly throughout the world. This fact has been linked to climate variability influencing directly over the life cycle of the vector that transmits the disease. There is growing evidence that outbreaks of dengue fever are strongly correlated with the phenomenon of the El Niño Southern Oscillation (ENSO). The ENSO is a natural phenomenon that involves changes in the temperature of the equatorial Pacific Ocean as oceanic components correspond to the emergence of relatively warmer water surface (El Niño) or colder water surface (La Niña) than normal in the Central and Eastern Tropical Pacific, off the coast between northern Peru and southern Colombia. In addition, when temperatures are around the average of these two extremes, a neutral phase also occurs. The sea surface temperature is used to identify the ENSO, and therefore, there are different indices that depend on the region of the Pacific in which the measurement is made. One of the most frequently used is the Oceanic Niño Index, which shows temperature anomalies in the Central-Western region of the Pacific Ocean known as Niño 3.4. Due to its geographic location, Colombia receives the direct influence of climate variability associated with the ENSO phenomenon, affecting the distribution of rainfall and temperature, especially in the Pacific region. This fact and the geographical and ecological conditions in the Department of Cauca promote the transmission of dengue fever in different municipalities with behavior endemoepidemic type and appearance of periodic outbreaks of different magnitudes. Several studies around the world show that there is a relationship between dengue fever and climate.,,,,,,, However, a deep understanding about the variables affecting epidemiology of dengue fever in Colombia is still missing. In particular, areas where the disease is a major public health problem with increasing trend. Johansson et al. (2009) showed a close association between monthly changes in temperature and precipitation and dengue transmission in Puerto Rico. In addition, they pointed the collinearity as a great challenge in the modeling works and its implications. This is because the climate variable and dengue incidence are strongly seasonal and can cause a misinterpretation of data, with the effects appearing over weeks or months later. This fact has been considered in the present study. In this sense, the main objective of this study was to analyze the relationship between dengue cases with climatic variables in 42 municipalities the Department of Cauca reported in the period January 2006 to December 2015. This was done through a multivariate linear regression model estimated by ordinary least squares (OLS) with time series data. This study is a first approach of the effect of climatic variability on the dynamics of dengue fever transmission in the Department of Cauca. The information provided by this study could be used by health agencies to develop strategies to analyze and predict the dynamics of dengue fever transmission in a time-sensitive, strengthening, and surveillance systems in public health for program planning for disease control. It is important to note that this study is the first to be held in the southern and western Colombian Pacific coast. This area that receives the direct influence of the climate variability associated with the ENSO phenomenon and where dengue fever is a public health problem priority. The region of Cauca is located in south west Colombia between the Andean and Pacific area, 00 ° 58' 54 “and 03° 19' 04” north latitude and 75 ° 47' 36” and 77° 57 '05” west longitude [Figure 1]. It has an area of 29,308 km2. According to the 2005 census, projections of population for the year 2015, a population of 1,379,169 inhabitants were estimated. Cauca has an average annual rainfall of 2132 mm. Likewise, the natural vegetation cover generates considerable variability in climatic conditions of the regions that make up the department. The epidemiology of dengue fever cases records was provided by Cauca State Health Secretary. All cases of dengue fever from January 2006 to December 2015 were considered. Data were collected and systematized through the National System for Public Health Surveillance (SIVIGILA) of Colombia. The study period consisted of a 10-year period from January 2006 to December 2015. The meteorological variables of temperature and the monthly accumulative precipitation were obtained from the National Institute of Hydrology, Meteorology, and Environmental Studies of Colombia (IDEAM). The periods of ENSO were defined by the Climate Prediction Center of National Oceanographic Atmospheric Agency, taking into account the monthly report from January 2016 and the historical information about El Niño events. Multivariate linear regression model estimated by OLS with time series data was used to analyze the relationship between dengue fever cases, temperature, precipitation, and the period of ENSO. Where Den variable denotes the number cases of dengue; Niño, Niña, and Neu are dummy variables indicating the El Niño, La Niña, and Neutral phases. The trend of dengue cases on time is the variable trend. The average temperature (°C), lagged in one period, is represented by temp1. Accumulated precipitation in the Cauca region (mm), lagged in one period, is denoted by prec1. The seasonal (monthly) component is introduced through SM, a set of seasonal dummy variables for the first semester of the year (t: 1–6), for a reason previously explained. Finally, is random error term. To avoid another possible problem of multicollinearity, different scenarios are tested using the functional form of equation 1. This can appear because low temperatures are associated to high precipitations and vice versa, thus if these climatic variables are considered together could cause a mistake. The distribution of monthly dengue cases for each year will be analyzed together the phase ENSO. The climatic variables (mean temperature and accumulative precipitation) will be also presented. Subsequently, the prediction of the model with the interaction between variables will be done, taking including different scenarios. During the period from January 2006 to December 2015; 4464 cases of dengue fever were reported, during which time, the highest percentage of cases (34.81%) were reported in 2010, with a total of 1554 cases. [Figure 2] shows the cases of dengue fever in 2006–2015. As it can be seen, in descending order, the years with the major amount of dengue cases are 2010>2009>2015>2011>2013>2008>2012>2007>2014> 2006. In general, the dengue cases increased in the first semester of the year followed by a decrease at the end. This is not true for 2009, where the opposite trend was observed. Dengue cases tend to increase in 2011 and it presents an oscillatory behavior. These phenomena are caused because of changes in the precipitation patterns during these years. A marked increase of dengue can be observed on in February; however, this can be observed since atypical data have been considered. [Figure 3]a shows dengue accumulative cases reported for every month from January to December. The right y-axis represents the sum of cases of El Niño and La Niña phases for the same period. [Figure 3]b is observed the monthly accumulative precipitation and the mean temperature for the Cauca Department. A remarkable increase in dengue cases is noted for January, March, April, and May, followed by a decrease in the middle of the year and a rise at the final months of the year. This behavior coincides with the number of years with El Niño and La Niña. This first approach could draw a positive relationship between dengue and phases. The same trend is observed for the accumulative precipitation [Figure 3]b with marked differences between the values of the starting and ending period of the year compared to middle months. In contrast, the mean temperature, in the Department of Cauca, does not show great variation, just 1°C. [Table 1] shows the β values in different scenarios analyzed. The first column takes into account all explanatory variables in the equation 1, but it was previously mentioned this scenario of the model present multicollinearity. This is the reason why very few variables are significant despite a high R 2. The second scenario (column 2) is an ANOVA model controlled by phases, where the expected value of the dengue cases is higher in the El Niño phase than in the others ones. Thirty-five dengue cases were presented in El Niño phase compared to 27 and 21 cases for La Niña and Neutral, respectively. In this way, between 8 and 14 additional cases were found if in the Cauca in El Niño phase following this model of column 2. In the next column (3), the season (monthly) adjustment was considered. This ANOVA model confirms that great majority of cases occur in April with approximately 35 cases, with between 4 and 16 additional cases than in another month (P< 0.01). April presents a high precipitation in the state of Cauca [Figure 3]b. The column (4) includes the phases, season, trend, and precipitation. This value has negative sign value, but the rest of the variables present the same pattern previously analyzed. The models 5 and 6 are similar; the only difference is that column 5 includes precipitation and excludes temperature, and column 6 shows otherwise. In both cases, the influence is limited.Approximately 2000 mm of rainfall is required to achieve 1 additional dengue case per month. Besides, when temperature rises by 1 degree Celsius, dengue cases increase in <1 case monthly, thus around of 2°C are required to get 1 additional dengue case. In addition, considering these scenarios, a minimum variation of seasonal dengue is found between March, April, and May. Dengue fever is a mosquito-borne viral disease that has spread rapidly in recent years. According to the confirmed cases reported in SIVIGILA in the Department of Cauca, a temporary variation was found in the number of dengue fever cases associated with changes with weather conditions. The majority of dengue fever cases (34.81%) were concentrated in 2010. A similar situation has been reported in studies conducted at a local-regional level in Risaralda  and Medellin  and at nationwide level in Colombia., Authors sustain that dengue fever cases have increased since the first case was described in 1989 and that dengue fever outbreaks are cyclical and are possibly related to climate change. At the global level, in Puerto Rico, an increase in the number of cases in 2010 was also reported. This fact can be related to climatic conditions presented in that year. 2010 was characterized especially by elevated temperatures and conditions of the El Niño phenomenon in the 1st month of the year. Climate variability has been recognized as one of the factors that influence diseases transmitted by vectors (ETV) worldwide, especially dengue fever. To determine the influence of climatic variables on the dynamics of transmission of dengue fever, studies have been done in Colombia,, Puerto Rico,, Mexico,,, Brazil,,,, and Taiwan, where mainly microclimatic variables such as temperature, precipitation, and relative humidity were considered. In the present study, we found that there is variability in the number of dengue cases for different periods of ENSO. This result is related to those found in a regional analysis by the WHO, where it was suggested that the climate variability associated with the El Niño phenomenon in South America is related to the intensity of dengue fever transmission. A similar study in Colombia found that, between 1980 and 1992, during El Niño season, outbreaks of dengue fever were observed. In Cereté (Department of Córdoba-Colombia), the average of cases during the El Niño was significantly higher than for the period of La Niña between 2003 and 2008. At Central-South America, an analysis of dengue fever cases reported between 1995 and 2004 indicates a greater number of dengue fever cases for the years in which the El Niño phenomenon occurred and states that they have a cyclical behavior in countries like Cuba, Belize, Guyana, Costa Rica,, and Mexico. Asian countries like Thailand and Indonesia, where dengue fever is endemic, it was found that the monthly variation in the incidence was attributed to weather conditions associated with El Niño., All previous analyzed studies are in according to our model where El Niño phenomenon presents a higher influence on dengue cases, under all scenarios considered [Table 1]. This seems to be logical considering that temperature rises in great part of the countries mentioned during El Niño phase, what causes an increase in life cycle of transmitting mosquito. In contrast to the results that were obtained, a study in Medellin reported that the increase in dengue fever cases took place in the years after the occurrence of the El Niño, and in Venezuela, the majority of the cases were registered in the years when El Niño phenomenon did not happened. These results may have been influenced by other factors such as climate: geography, socioeconomics, and culture, which can also affect the increase of dengue fever cases as marked as meteorological parameters. As mentioned, El Niño is closely related to changing weather patterns, mainly in the precipitation and temperature. In Colombia, this event is associated to with lower precipitation, whereas La Niña is associated with heavier precipitation. This trend has been observed by Struchiner et al. in their study on the influence of climate parameters for the increase of dengue in Singapore, for the period between 1974 and 2011. They mentioned that mean and minimum annual temperature had a great positive influence in dengue incidence. However, precipitation was not associated with the increase of dengue. In comparison with the present work, the multivariate linear regression model shows a moderate influence of mean temperature under scenario 6 [Table 1] and a negligible influence of precipitation in scenario 5, just like the previous finding; following the model, it is required 2,000 mm of rain per period to increase dengue in one case. Sang et al. (2016) suggest that “heavy rain can flush away the egg, larvae, and pupae of Aedes mosquitoes in the short term, but rainfall can create huge breeding habitats for mosquito in the long run.” This latter fact appears to have little or no influence on the number of reported dengue cases. The temperature lag has a low impact because it has a cyclical component. In the case of lagged rainfall, the impact is very poor since the unit of measure is millimeters. The variable dependent (dengue cases) increases under all scenarios with the time during the study period [Table 1]. This is reasonable because of the average population; growth rate was about 0.89% during the study time. Different studies conclude that population corresponds to a determining variable in the increase of dengue cases in time. Finally, the higher peak of dengue fever is observed in the first semester of the year, mainly on April according to the model developed in the present work. This fact is presented 3 months after of the period with high precipitation (O, N, D), and previous work has mentioned 90 days of lagged effect on dengue cases, what coincides with the present work. This despite model does not show great relationship between those variables. Under all cases evaluated, the presence of the phases of La Niña, El Niño, and Neutral increases the cases of dengue in the Department of Cauca, but at different levels: During El Niño phase, more cases occurred followed by the phase of the La Niña and in the Neutral phase. According to the month of the year dengue, cases behave differently in the first semester and there is a higher prevalence than in the second one, especially in April. The difference lies on the magnitude of the effect. Temperature is presented as a moderate driver of dengue cases with 1 additional case of dengue when temperature is increased in 2°C, whereas precipitation shows a negligible effect. 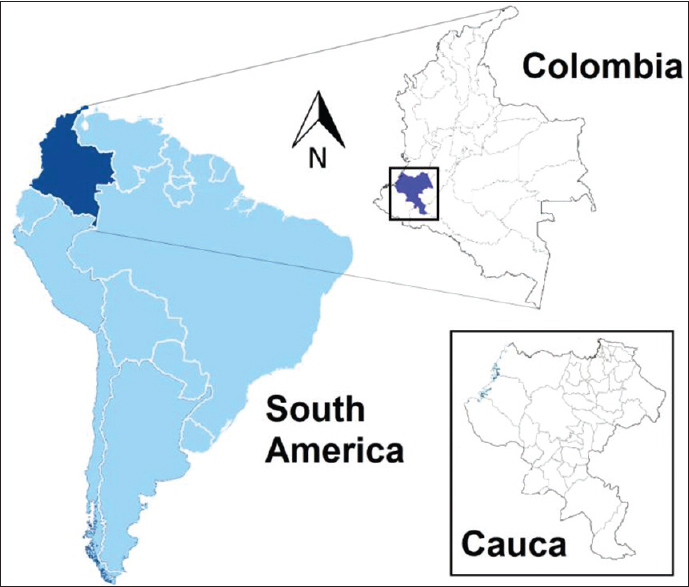 Additional variables influencing dengue cases should be considered for the analysis of the variability of dengue fever cases in the Department of Cauca, such as population and incidence of another disease. This information and the climatic variables, as those evaluated in the present work, have been shown to be an important epidemiological component that could be used to design control measures that permit the monitoring and prevention of dengue fever. The present work corresponds to an important tool leading to develop a dengue early warning system, which will be useful to achieve an effective control in the Department of Cauca and other states. Barros V, Field C, Dokke D, Mastrandrea M, Mach K, Bilir TE, et al. Climate Change 2014: Impacts, Adaptation, and Vulnerability. Part B: Regional Aspects. Contribution of Working Group II to the Fifth Assessment Report of the Intergovernmental Panel on Climate Change. Cambridge: Cambridge University Press; 2014. Available from: https://www.ipcc.ch/pdf/assessment-report/ar5/wg2/WGIIAR5FrontMatterB_FINAL.pdf. [Last accessed on 2015 Jun 30]. Colombia's Environmental Information System - IAC. Available from: https://www.siac.gov.co/contenido/contenido_imprimir.aspx?conID=1240a&catID=374. [Last accessed on 2015 Jul 06]. Climate Prediction Center – Monitoring & Data: ENSO Impacts on the U.S. – Previous Events. Available from: http://www.cpc.ncep.noaa.gov/products/analysis_monitoring/ensostuff/ensoyears.shtml. [Last accessed on 2015 Jun 02]. Poveda G, Graham N, Epstein P, Rojas W, Quiñines M, Vélez ID, et al. Climate and ENSO Variability Associated with Vector-Borne Diseases in Colombia. Available from: http://www.users.clas.ufl.edu/prwaylen/geo3280articles/Poveda.pdf. [Last accessed on 2015 Sep12]. Padilla J, Rojas D, Sáenz-Gomez R. Dengue in Colombia: Epidemiology of the reemergence to hyperendemia; 2012. Available from: http://www.academia.edu/7533149/Dengue_en_Colombia_epidemiolog%C3%ADa_de_la_reemergencia_a_la_hiperendemia. [Last accessed on 2015 May 18]. Rúa-Uribe GL, Suárez-Acosta C, Chauca J, Ventosilla P, Almanza R. Modelling the effect of local climatic variability on dengue transmission in Medellin (Colombia) by means of time series analysis. Bioméd Rev Inst Nac Salud 2013;33 Suppl 1:142-52. Cassab A, Morales V, Mattar S. Climatic factors and cases of dengue in Monteria, Colombia: 2003-2008. Rev Salud Publica (Bogota) 2011;13:115-28. Méndez-Lázaro P, Muller-Karger FE, Otis D, McCarthy MJ, Peña-Orellana M. Assessing climate variability effects on dengue incidence in San Juan, Puerto Rico. Int J Environ Res Public Health 2014;11:9409-28. Jury MR. Climate influence on dengue epidemics in Puerto Rico. Int J Environ Health Res 2008;18:323-34. Colón-González FJ, Lake IR, Bentham G. Climate variability and dengue fever in warm and humid Mexico. Am J Trop Med Hyg 2011;84:757-63. Câmara FP, Gomes AF, Teixeira G, Cardoso D. Climate and epidemics of dengue in the State of Rio de Janeiro. Rev Soc Bras Med Trop 2009;42:137-40. Hurtado-Díaz M, Riojas-Rodríguez H, Rothenberg SJ, Gomez-Dantés H, Cifuentes E. Short communication: Impact of climate variability on the incidence of dengue in Mexico. Trop Med Int Health 2007;12:1327-37. Johansson MA, Dominici F, Glass GE. Local and global effects of climate on dengue transmission in Puerto Rico. PLoS Negl Trop Dis 2009;3:e382. Promprou S, Jaroensutasinee M, Jaroensutasinee K. Climatic factors affecting dengue haemorrhagic fever incidence in Southern Thailand. Dengue Bull 2005;29:4-8. SIAT. Plantilla Departamento Cauca. Available from: http://www.siatac.co/Atlas/cauca.html. [Last accessed on 2015 Jul 23]. Climate Prediction Center: ENSO Diagnostic Discussion. Available from: http://www.cpc.ncep.noaa.gov/products/analysis_monitoring/enso_disc_jun2015/ensodisc.html. [Last accessed on 2015 Jul 24]. World Health Organization WH. Dengue: Guidelines for Diagnosis, Treatment, Prevention and Control. World Health Organization. Available from: http://www.who.int/tdr/publications/documents/dengue-diagnosis.pdf. [Last accessed on 2015 Jul 24]. Quintero-Herrera LL, Ramírez-Jaramillo V, Bernal-Gutiérrez S, Cárdenas-Giraldo EV, Guerrero-Matituy EA, Molina-Delgado AH, et al. Potential impact of climatic variability on the epidemiology of dengue in Risaralda, Colombia, 2010-2011. J Infect Public Health 2015;8:291-7. Castrillón JC, Castaño JC, Urcuqui S. Dengue in Colombia, ten years of evolution: Ten years of database records. Rev Chil Infectol 2015;32:142-9. Restrepo AC, Baker P, Clements AC. National spatial and temporal patterns of notified dengue cases, Colombia 2007-2010. Trop Med Int Health 2014;19:863-71. Brunkard JM, Cifuentes E, Rothenberg SJ. Assessing the roles of temperature, precipitation, and ENSO in dengue re-emergence on the Texas-Mexico border region. Salud Publica Mex 2008;50:227-34. Günther J, Ramírez-Palacio LR, Pérez-Ishiwara DG, Salas-Benito JS. Distribution of dengue cases in the state of Oaxaca, Mexico, during the period 2004-2006. J Clin Virol 2009;45:218-22. Gomes AF, Nobre AA, Cruz OG. Temporal analysis of the relationship between dengue and meteorological variables in the city of Rio de Janeiro, Brazil, 2001-2009. Cad Saude Publica 2012;28:2189-97. Gomes AF. Analysis of spatial and temporal relationship between dengue and meteorological variables in the city of Rio de Janeiro, during 2001 to 2009; 2011. Available from: http://www.bvssp.icict.fiocruz.br/lildbi/docsonline/get.php?id=2397. [Last accessed on 2015 May 09]. Regis LN, Acioli RV, Silveira JC Jr., de Melo-Santos MA, da Cunha MC, Souza F, et al. Characterization of the spatial and temporal dynamics of the dengue vector population established in urban areas of Fernando de Noronha, a Brazilian oceanic island. Acta Trop 2014;137:80-7. Chien LC, Yu HL. Impact of meteorological factors on the spatiotemporal patterns of dengue fever incidence. Environ Int 2014;73:46-56. Githeko AK, Lindsay SW, Confalonieri UE, Patz JA. Climate change and vector-borne diseases: A regional analysis. Bull World Health Organ 2000;78:1136-47. Mattar S, Morales V, Cassab A, Rodríguez-Morales AJ. Effect of climate variables on dengue incidence in a tropical Caribbean municipality of Colombia, Cerete, 2003-2008. Int J Infect Dis 2013;17:e358-9. Ferreira MC. Geographical distribution of the association between El Niño South Oscillation and dengue fever in the Americas: A continental analysis using geographical information system-based techniques. Geospat Health 2014;9:141-51. Fuller DO, Troyo A, Beier JC. El Niño Southern Oscillation and vegetation dynamics as predictors of dengue fever cases in Costa Rica. Environ Res Lett 2009;4:140111-8. Tipayamongkholgul M, Fang CT, Klinchan S, Liu CM, King CC. Effects of the El Niño-Southern Oscillation on dengue epidemics in Thailand, 1996-2005. BMC Public Health 2009;9:422. Bangs MJ, Larasati RP, Corwin AL, Wuryadi S. Climatic factors associated with epidemic dengue in Palembang, Indonesia: Implications of short-term meteorological events on virus transmission. Southeast Asian J Trop Med Public Health 2006;37:1103-16. Rúa GL, Calle DA, Rojo RA, Henao EA, Sanabria WH, Suárez CR. Influence of the Niño climate event on dengue transmission dynamics in Medellin, Antioquia, Colombia. Iatreia 2012;25:314-22. Rifakis P, Gonçalves N, Omaña R, Manso M, Espidel A, Intingaro A, et al. Association between weather variations and dengue fever cases in a hospital in Caracas, Venezuela, 1998-2004. Rev Peru Med Exp Salud Publica 2005;22:183-90. Poveda G, Mesa OJ. Feedbacks between hydrological processes in tropical South America and large-scale ocean-atmospheric phenomena. J Clim 1997;10:2690-702. Struchiner CJ, Rocklöv J, Wilder-Smith A, Massad E. Increasing dengue incidence in Singapore over the past 40 years: Population growth, climate and mobility. PLoS One 2015;10:e0136286. Sang S, Shaohua G, Bi P, Yang W, Yang Z, Xu L, et al. Predicting Unprecedented Dengue Outbreak Using Imported Cases and Climatic Factors in Guangzhou. PLOS, Neglected Tropical Disease 2015; 9:1-12.